At Marylise we are convinced that “Sustainability is not a temporary phenomenon; it is the future. As a fashion company, we want to take on our responsibilities whilst retaining our individuality. Creativity and quality remain the priority. The consumer is also increasingly asking for ecologically sound products and we have to offer a solution to that.” These are the sentiments of Cedric, Chiara and Ann-Sofie (pattern maker). Together they explain how, in cooperation with Flanders DC, they integrate corporate social responsibility with Marylise into business operations. Does Marylise already score well in certain aspects of sustainability? Chiara: Certainly. We make wedding dresses on order and therefore do not produce overstock. Since we deliver directly to our customers as a producer, we also perform well on the logistics side. We believe that sustainable entrepreneurship will become the standard and that is why more needs to be done. You do this with Flanders DC. How does this collaboration work? Ann-Sofie: We had applied for and were selected by them. Their specialists are our right hand. They are now helping us to take the first steps in a pilot project that runs from October 2018 to September this year. The goal is to have a concrete action plan ready by the end of that period so that corporate social responsibility can gradually trickle into our DNA. How do you work exactly? Cedric: We work in different phases. There is a lot involved: firstly we have taken a close look at production, design and logistics, but also internal working conditions. We have started mapping out our entire chain to identify key areas for improvement. Ann-Sofie: We look at the possibilities in terms of production and design. For example, together with a fabric expert and our design team, we visited the Première Vision fabric fair in Paris to check how realistic it is to get our current fabric suppliers in our project and for what period of time. We want guarantees that they produce sustainably and that is why we examine how ethically and ecologically they work and how materials are created. In addition, we closely follow new trends. We look specifically for new producers of ecological yarns. Our designers and pattern makers also think alongside us about potential improvements in the way we do things. How do they contribute their part? Ann-Sofie: One of the questions that concerns us is how we can produce less waste, for example how we can use fabric as wisely as possible. And then there is also the transportation of the dresses. Here too, we want to work with partners who, like us, limit their ecological footprint by, for example, sending packages that are CO2-neutral. You also talked about internal working conditions? Cedric: Indeed: a pleasant working climate and fair compensation. We have consciously chosen to produce in Europe. In our production unit in Portugal we have a strong relationship with our trained team that can work in positive conditions and receive a fair and correct wage for the work they do. They work in a new and modern building that is ecologically sound. Soon we will be moving from Herentals to Antwerp and we also view that as an opportunity. Chiara: What we are striving for is a change of mentality. Everyone can contribute to that. For example, plastic water bottles will no longer be available in the new company buildings. These have been replaced by a faucet with filter system. There are also small things that anyone can do, such as turning off your computer every night and no longer printing e-mails. We put such tips on the bulletin board because we make a difference with these quick wins. We want to make all employees aware of this. Does it all affect the price of the wedding dresses? Cedric: The question we constantly ask ourselves is: Is this economically feasible? you simply can not push up the price of your product. One example: the packaging of our dresses. In which type of garment cover do we put them, on which coat rack do we hang them? What kind of paper do we use? Alternatives are great, but an ecological coat rack, for example, is easily two to three times more expensive. So it is a constant balancing act. Are there limits to sustainability? Cedric: Ideally, the process is circular. This means that the customer will become a supplier again. Think of denim: you buy a pair of jeans and if you no longer wear it, you return it and the fabric is recycled. For us this is a challenge because a wedding dress is an emotional product and processing it back to a raw material is not easy or viable. Ann-Sofie: One of the ideas is to inspire brides to transform their dress into, for example, a nice top and skirt that they can wear further or a christening dress for their children. We want to inform and inspire them. We therefore work internally on this idea in a more sensational way. So communication plays an important role? Chiara: Certainly. 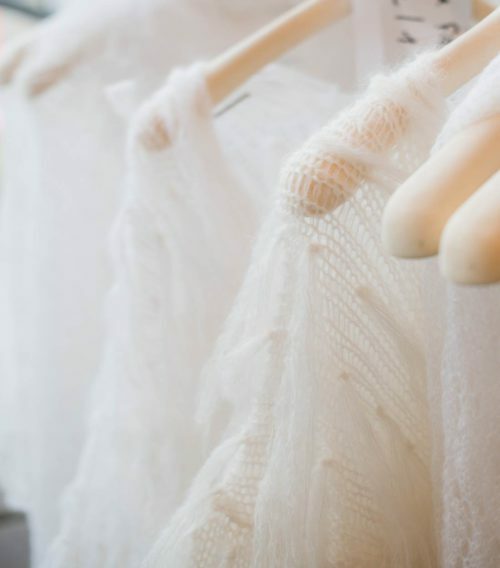 Customers – both brides and boutiques – often ask where and by whom dresses have been made. We want to communicate transparently about production and our vision on sustainability. We have nothing to hide. On the contrary, we are proud of what we are achieving.